The aim of this study was to assess pelvic floor muscle (PFM) function using transabdominal ultrasound (TAUS) in women attending group exercise classes. Specific aims were to: (1) identify the ability to perform a correct elevating PFM contraction and (2) assess bladder-base movement during an abdominal curl exercise. Ninety women participating in group exercise were recruited to complete a survey and TAUS assessment performed by two qualified Continence and Women’s Health physiotherapists with clinical experience in ultrasound scanning. The assessment comprised three attempts of a PFM contraction and an abdominal curl exercise in crook lying. Bladder-base displacement was measured to determine correct or incorrect activation patterns. Twenty-five percent (n = 23) of women were unable to demonstrate an elevating PFM contraction, and all women displayed bladder-base depression on abdominal curl (range 0.33–31.2 mm). 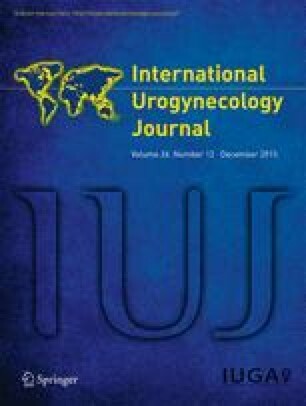 Parous women displayed, on average, significantly more bladder-base depression than did nulliparous women [15.5 (7.3) mm vs 11.4 (5.8) mm, p < 0.009). Sixty percent (n = 54) reported stress urinary incontinence (SUI). There was no association between SUI and the inability to perform an elevating PFM contraction (p = 0.278) or the amount of bladder-base depression with abdominal curl [14.1 (7.6) mm SUI vs 14.2 (6.7) mm non-SUI]. TAUS identified that 25 % of women who participated in group exercise were unable to perform a correctly elevating PFM contraction, and all depressed the bladder-base on abdominal curl. Therefore, exercising women may be at risk of PFM dysfunction when performing abdominal curl activities.